Senate President, Dr. Abubakar Bukola Saraki today said the on-going investigation into the arms deal in the Office of the National Security Adviser has called to question whether the Senate is effective in the performance of its oversight functions. Saraki in his remark during the plenary session in the legislative chamber on a motion titled “Abandonment of Projects : A Menace to Development in Nigeria” sponsored by Senator Suleiman Nazif (Bauchi North) said if the Senate Committees on National Security and Intelligence as well as the one on Defence had performed their constitutional roles in monitoring and investigating how funds allocated to that sensitive area had been utilised, the nation will not be witnessing the mind-boggling stories that are coming out. He further charged Committees of the upper chamber to take their duties more seriously to prevent the high rate of abandoned projects and fraudulent tendencies of government officials. “I want us in this 8th Senate to ensure that our committees carry out proper oversight and that we in the leadership are going to ensure that we find a way to make sure that committees do their work on oversight because truly that is the bottom line to this”, he said. “Even the current investigation going on in the National Security Advisers Office, whether we like it or not, in a way too raises valid questions about the oversight function of the National Assembly. We must play our roles in the area of oversight because if we don’t do it, at the end of the day this is what we will get”. 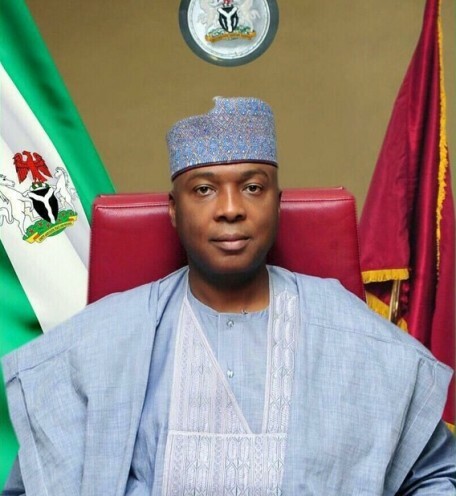 The Senate President said a proper Senate oversight function would have revealed and prevent all the mess that an investigation directed by President Muhammadu Buhari is now revealing. “We all have a responsibility to support the on-going efforts in the Presidency to get to the root of this investigation. Also, the anti-corruption war being waged by the Buhari administration deserves the support of all of us. Nigerians can be sure that the Eighth Senate will do all that is necessary to make ensure that funds appropriated for projects are utilised for what they are meant. “I want us to make a difference. We should really perform our oversight functions diligently. We will put a system in place where we will be asking the committees to give us periodic situation report on their functions and the oversight that they are doing so that this negative development of abandoned projects will be a thing of the past. We should move forward in providing a new way by which the National Assembly can carry out its functions more efficiently and with more dexterity”, he said.